In a workshop just a short drive from our office in Lewes, a young craftsman works day after day to create fine, traditional instruments. 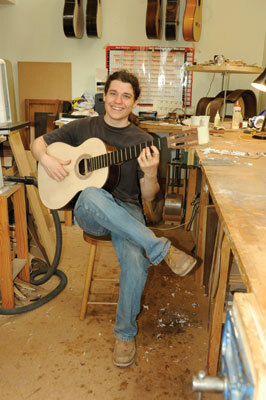 Stephen Eden is a Spanish guitar maker whose work is already becoming renowned. He learned under Stephen Hill before spending two years as apprentice to Pablo Requena - both internationally esteemed makers - and has now been a maker in his own right for close to five years. 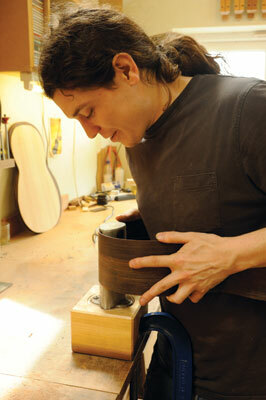 We paid him a visit to see first-hand how these beautiful instruments are made. 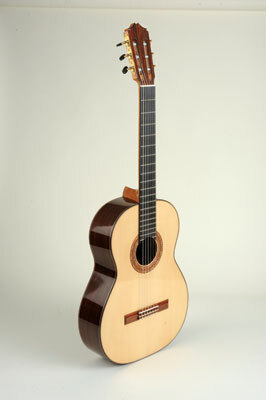 The flamenco guitar differs from both the steel string and the classical. The difference between flamenco guitars, which have nylon strings, and the much stronger, heavy construction of steel-string guitars is like chalk and cheese. 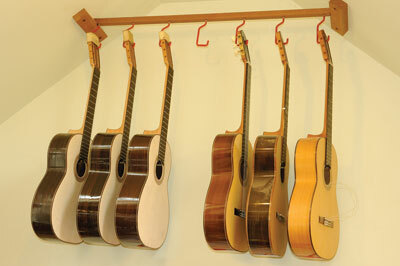 In fact, the flamenco guitar is a much closer relative of the classical, which is also nylon-strung. Stephen makes both styles, which are both of Spanish origin. 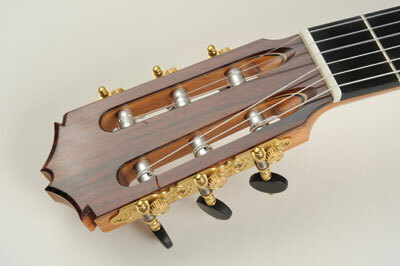 The soundboard - that is the top board of the body - is thinner on the flamenco form, to give a punchier, bright sound quality to suit the explosive energy and percussive nature of flamenco music, as opposed to the thicker soundboard and heavier general build of the classical guitar, which gives a deeper acoustic warmth and resonance. The soundboard of the flamenco guitar is made of specially selected, light quartersawn Italian spruce (Picea abies), with fractionally graduated thickness increasing from the outside towards the centre. With thickness graduations of under 0.5mm involved, Stephen tends to favour digital callipers. 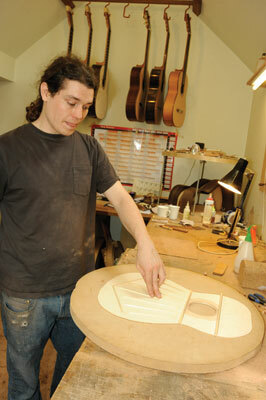 For the soundboard of a classical guitar, Stephen can use Western red cedar (Thuja plicata) to give a warmer sound. The soundboard is internally strutted with bars of the same wood. As it is very slightly domed, the struts are glued onto the soundboard as it sits in a dish that Stephen routed based on a 15ft radius circle - one of his many handmade jigs. 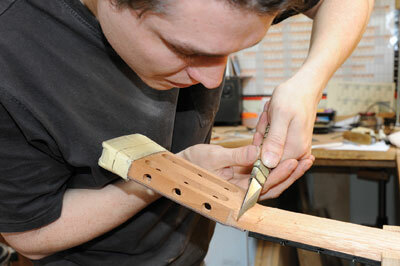 Keeping the soundboard and struts curved while the glue dries is not a job for conventional clamps; Stephen uses a guitar-making jig known as a 'go-bar deck' - flexible compression rods are stood at several points on the struts and are held down by a deck above. 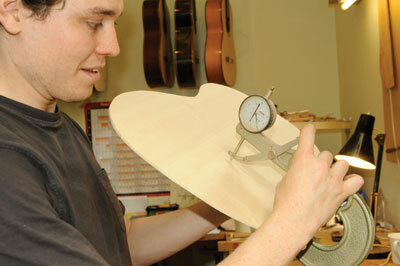 When the glue has dried, the struts support the slight curvature, but the size and shape of them also play an important part in the guitar's tonality. He uses a tiny plane to shape the struts, with minute alterations in the shape affecting the balance of bass and treble frequencies. 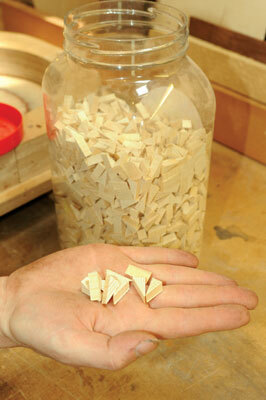 "Sometimes it's like woodworking to an engineering limit." Stephen meticulously selects all materials himself. For the soundboard, the best cut from split billets with the straightest grain is taken to prevent runout, as strength is needed lengthways to comfortably take the string tension. As he pulls out a pile of 40 soundboard blanks from under the worktop he tells me: "I looked through hundreds of stacks before I picked these out," unsurprisingly, mass manufacturers don't tend to do the same. 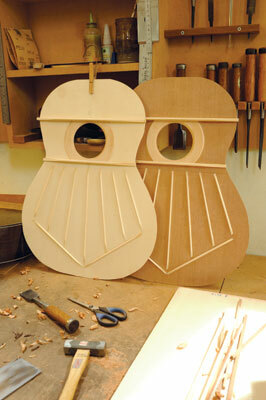 "One main difference between what luthiers and manufacturers do is in the stock selection. Where I take time to select the best wood I can get from thousands of pieces, manufacturers will go in and take the whole lot, so you can end up with weak parts which won't sound the same or last as long." Stephen shows me a bulky guitar-shaped press, containing 120W lightbulbs to heat the Indian rosewood (Dalbergia latifolia) sides for bending, but he has found that springback occurs after the wood cools, wasting time. 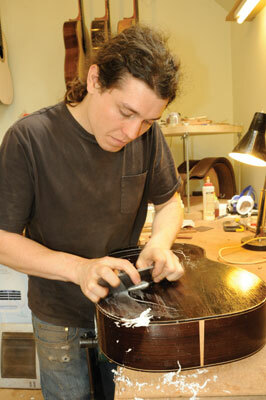 Instead, Stephen prefers to use an electrical bending iron: "I like to use a lot of modern techniques to produce a traditional guitar." The bookmatched back is also usually made of Indian rosewood, which has decorative qualities but is also very strong even at a low thickness. 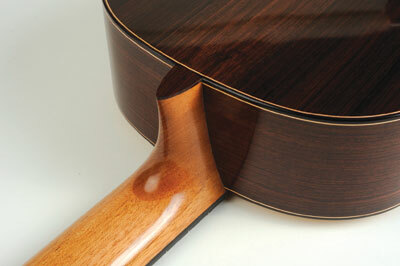 It is also used for the headplate and the bridge, where the strings meet the body. The neck is made of South American cedar (Cedrela odorata), Stephen was at the stage where he was subtly carving the back of the neck's profile to blend into the head when we arrived. He uses a small Japanese knife with a double bevel to slice the profile rather than the more coarse option of a rasp. Japanese tools feature prominently in various stages of Stephen's work. He uses the Japanese pull saw for precise cutting, especially when cutting the frets in the ebony fingerboard, and also for cutting the slot where the heel of the neck enters the body: "I wouldn't be able to make some of the cuts accurate enough with a pushing motion." 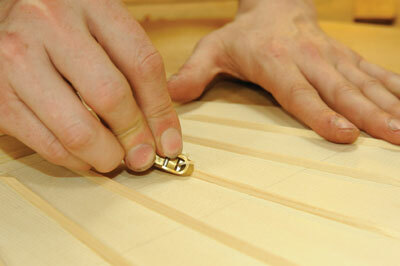 He also likes to use Japanese panel saws with a hooked end, so he is not limited to only start cuts at an edge. He pushes the shoulder of his Japanese chisels to ease cuts in - there is something to be said for the value of Japanese tools in this delicate approach to woodwork. 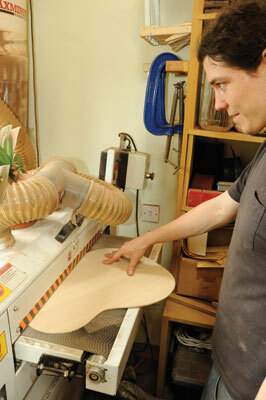 Stephen also swears by his thickness sander: "Most guitar makers who have converted from hand planing to the thicknesser will tell you it's the most useful machine in the world," he says. Stephen has to thickness 6mm boards down to 2-3mm without tearout, a manoeuvre that's not for the faint-hearted: "You have to know the machine quite well," he explains, "but if you can work out exactly what your machine does, you can get it to do most of the thicknessing for you." The neck, back, top and sides can be built in any order, then these components are assembled in a wooden mould: "This is what defines the Spanish method for me. With the top face down, you attach the neck first and then the sides are attached with peones." The 'peones' Stephen refers to - a name taken from the Spanish 'peon' for pawn - are the small strips of wood that connect the sides to the front along the curvature of the edges. Many call them 'tentalones', perhaps because of their tooth-like appearance; as with any craft, guitar making has some of its own language in addition to its techniques. 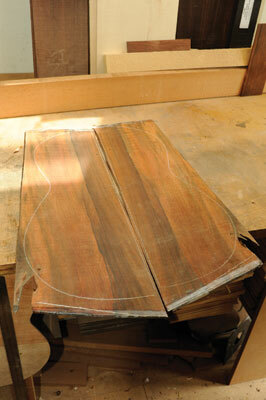 "Then you finish with the back, which has a laminated lining made of three layers of 1.5mm wood. I don't use any heat to bend that; it's glued into shape." Decorative bindings are added to the outside and serve both a visual and practical purpose, sealing up the end grain so moisture is unable to enter or escape. It is very important that the workshop is kept at a constant humidity of 40-50%, so despite the warm weather, all the windows and doors are shut - in the winter Stephen spreads water around the workshop to maintain this humidity. 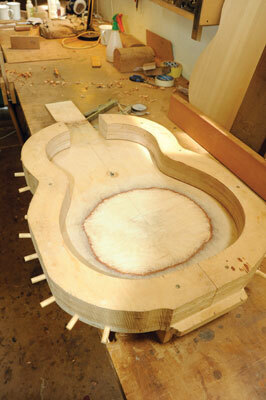 A guitar is face down on the worktop with glue glistening on the back of the body. "This one here is assembled and it's now being finished." Stephen explains that he uses epoxy resin as a grain filler, lets it harden and then scrapes it off. Having seen how much delicate precision goes into making the components, I winced a little at how forcefully Stephen scraped the epoxy from the back, but if proof was needed of the guitar body's sturdy build then this was it. "I find epoxy more effective than French polish as a grain filler and it's also about two weeks faster," he says, and his efficient working ethos is one reason he can afford to make a comfortable living from luthiery: "You can get in trouble if you just treat your work as an art and forget that it's a business, too." Stephen uses French polish as a finish rather than lacquer; as it is lighter it allows the guitar to move and breathe as it dries, and also makes it easier to repair marks - he maintains contact with his customers for after-sale care and repairs. Stephen also teaches from his workshop, and posts on guitar makers' forums, where makers of all levels share knowledge and advice. 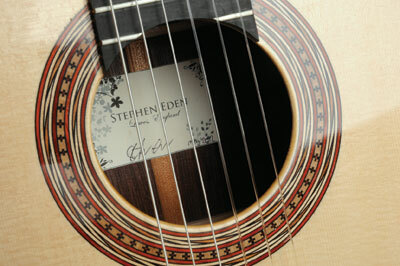 The guitar maker's signature comes in the form of an inlaid 'rosettes' and a carved and chamfered head, as well as his signed label inside the body. Stephen's decorative inlay includes padauk (Pterocarpus dalbergioides). â€œI have to get that down to thickness too... I can't find 1mm padauk anywhere!â€ His humour and the enjoyment he gets from his work make it hard to believe he was for a short time studying for a statistics degree. Thankfully, he made a wise choice. He sums up work with a thought that rings true for woodworkers of all disciplines: "What I like about working with wood is that even if I do everything in exactly the same way to build two guitars, the wood is a changeable, moving material, so no two pieces are ever really the same."